My brother-in-law was kind enough to purchase the #ArtBundlesforGood package as my Christmas gift. I immediately jumped into Effy Wild's Mixed Tape 1, where I did a lot of Bootcamp work. I have finally finished that section and have found some time to jump into the Mixed Tape Lessons. I love how Effy paints to music, but she doesn't encumber her students by requiring they do the same. Basically, we are instructed to use whatever inspiration we have, be it music or novels or scenery. I found inspiration for Lesson 1 in a young adult novel entitled "An Enchantment of Ravens," a scrumptious tale about humans interacting with the fairy world. My inspiration was the Prince of Autumn. The heroine barters protection from unseen dangers for the portrait she paints of him. While my rendering is not 100% accurate, again, it was my inspiration for this spread. 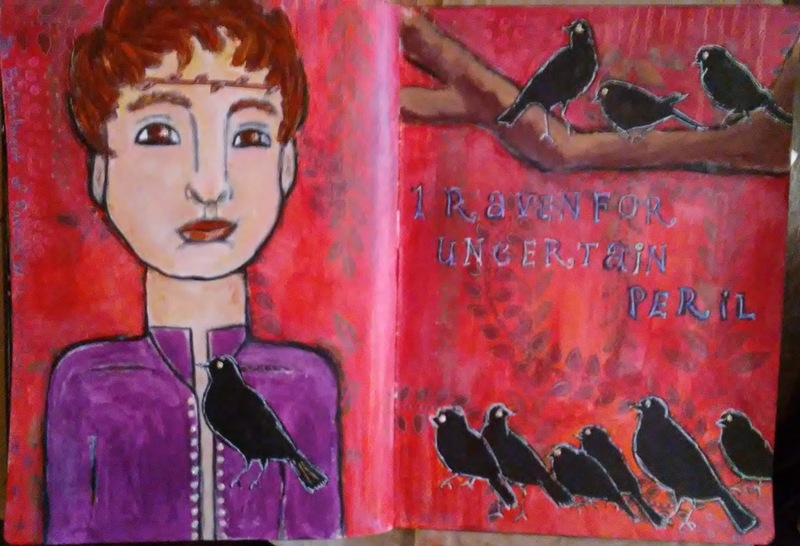 The writing reads: "1 raven for uncertain peril." 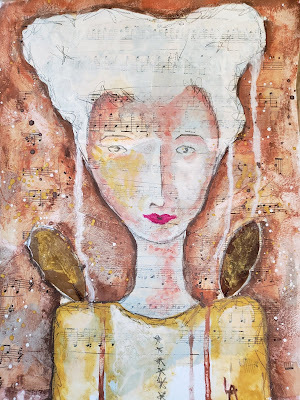 Stencils, fluid acrylics, acrylics, and white gel pen.